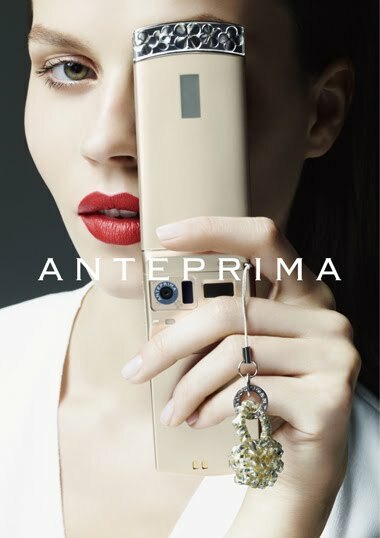 ANTEPRIMA Mobile phone will be launched by DOCOMO. Release time will be this November and exact date is to be confirmed. ANTEPRIMA Mobile Phone will be available in 5000 DOCOMO shops in Japan. The color is ANTEPRIMA Orogento with the hand-knitted wire strap in silver & gold. I made this product with my thoughts that this mobile phone should stay in soft color accompanying you all the time throughout the year. Decoration can be changed according to your lifestyle. I also want the mobile phone to be elegant in the party when being taken out from your handbag. Mini-mini-Wirebag is popular because it is so light that it will not scratch your mobile phone. The sophisticated hand-knitting of the wire enables gentle sparkling from this mini-mini-Wirebag which will go along as a gift attached with the mobile phone.